The great advantage to thinking about God in legal terms, is that nothing has to change. If what happens between us and God is entirely external, a matter of arranging things such as the avoidance of eternal punishment or the enjoyment of eternal reward, then the world can go on as it is. In the legal model that dominates contemporary Christian thought, the secular world of things becomes nothing more than an arena, the stage on which we act out our moral and psychological dilemmas, waiting only for our final grades to be issued when we die. In the contemporary world-view, Christ’s death and resurrection change nothing within the day-to-day world. Their effect is entirely and completely removed from this world and reserved for the next. This is a great advantage for Christian thought, for everything of significance becomes theoretical, removed from the realm of practical discussion. Not only does Christ’s work change nothing in this world, it changes nothing within us other than by moral or psychological suasion. And we therefore need argue or labor for nothing other than abstractions. The inert world of secularism is left intact. This is to say that if “accepting Jesus as my Lord and Savior” only brings about a change in my eternal disposition, then it is largely meaningless in this world. Everything Christians do in this world would be but tokens of eternity. But this is not the teaching of the New Testament or classical Christianity. When St. Paul says that in Baptism we are “baptized into the death of Christ,” he does not mean to suggest that this only brings a change in our eternal disposition. 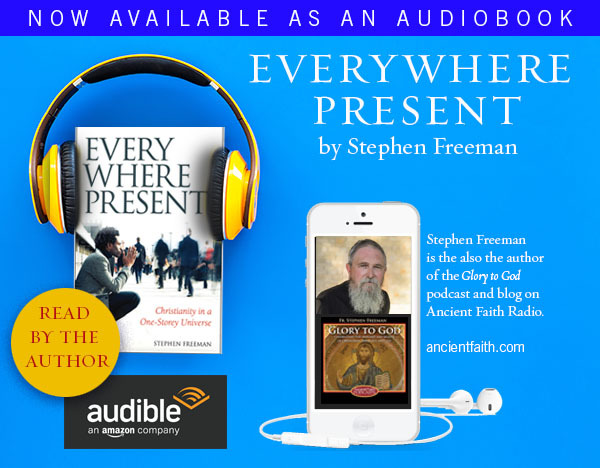 The historical death of Christ is also a transcendent event and is made truly present in the waters of Baptism and in the life of the believer. Christianity, in its true and original form, is decidedly realistic in its teachings. Bread and wine truly and really become the Body and Blood of Christ, etc. The miracles of Christ are more than moral lessons – they are genuine invasions of this world by the Kingdom of God, the in-breaking of heaven to earth. This spiritual realism is the foundation for the sacramental life of the Church as well as all ascetical and mystical practice. Orthodox Christians pray in order to unite themselves to Christ, not to advise Him or persuade Him. Every feast, like the sacraments themselves, is present tense, an indwelling of this world by the spiritual reality that it represents. And so our salvation in this world represents a transformation, the union of earth and heaven. The feast of Christmas, seen in this light, is a feast of transformation. There is nothing “legal” about the event. Our status in the eyes of God does not and has not changed – for we have always been beloved of God. It is because He loved us that He sent His Son into the world – that we might be transformed. We prepare ourselves for the feast of Christmas through prayer, fasting and acts of generosity because we expect to be changed. We expect ourselves to be the birthplace of God. It is there that the angels will sing and the wise men kneel. It is there that His most dear Mother will cradle Him in her arms and give Him the milk of our humanity. And it is there, in turn, that we ourselves will drink the gift of eternal life. But there is no moral to be drawn from the story, no psychological improvement expected. And for secularists (or secularized Christians) who might witness the Feast, their conclusion would be, “Nothing happened.” For the transformation wrought by Christ remains largely indiscernible to the outside viewer. It will ever seem “useless” to the world. Christ went about His life as fully God and fully man. And He was as much fully God before the working of His first miracle as He was the day after. None of His miracles were of any particular use (except for the few who were healed). But most of the blind people in Israel at the time remained sightless. Thousands of paralytics were never able to walk. And with but a very few exceptions, everyone who entered a grave during His ministry remained there and passed into dust. What good did Christmas do? The temptation is to defer the “good” of Christmas to an abstract theoretical reality. The greatest example of this abstraction has come through the evolution of the forensic (legal) model of the Christian faith – by far the dominant form of popular, contemporary Christianity. Believers are told that their religious actions have been met with approval by God and that their eternal life is secured. What remains to the Church in such an understanding is to concentrate on moral and psychological well-being and improvement. And yet, it is quickly noted that moral and psychological actions have no effect on eternity (for we are saved by grace and not by works), so that the moral and psychological benefits are simply temporary and of value only to the believers. These sentiments (feeling good about morality and psychology) are the currency in which the contemporary Church trades. But the transformation that Christ works in the world, sometimes known in the heart, is a treasure hidden. There is no argument that can prove it. Just as the disciples could not prove the resurrection, so we can only witness and say what we have seen. What we see and witness however will remain hidden to others. The mystery of Christ in this world is sometimes made manifest, a saint is allowed to show forth, an icon weeps. But the mystery remains hidden for a purpose. The redemption of the world does not come with observation (Luke 17:20). Were the Kingdom of God forced on the world its precious freedom, required by love, would be forfeit and all would be for nothing. But love preserves the freedom of the world at the cost of the obvious. And so it is the pure in heart who see God. Our hearts are not made pure by sentiment, nor can they be pure as a simple matter of legality. Instead, we fast and pray and labor to give, and the Kingdom suffers violence (but not the world), and the Kingdom yields its precious pearl to the eyes of the pure. This is the Christmas that is alone worth pursuing – illegal and buried deep in a darkened world. What darkness could comprehend it? Yes, father, if God, the Uncreated, really has stepped into His Creation, all bets are off and dealing with this event is the absolute occupation of every human. God becoming flesh changes everything. As ever, wonderful insight and perspective, Father! Thank you for this. Excellent message, dear Fr. Stephen. thank you. Would you have a word on the discerning need that arises, to balance between ‘hiding’ more and more out of respecting others’ (vehement) indifference (to this wonder we experience) – only ever witnessing with words when that is explicitly required? It is a tight rope! I find it is one of the commonest ‘practical living’ questions for fervent believers living amongst less “obssessed” (a v. good obsession of course…) persons (including their closest family) with a multitude of other (secular) interests and no interest in our sweetly wounded hearts’ one single interest that surfaces often. I would like to be able to understand (should I say discern) what Dino said in his comment, but as a new catechumen, I feel “excused” from catching on to what he is saying. Sorry…can someone please interpret for me? I am so sorry Sharon. What I was trying to convey was the significance of fasting and watchfullness. These can seem basic, especially bodily fasting, but they are truly indispensable on the path of purification. It is purity that helps open one’s spiritual eyes to be able to see God everywhere. One cannot find a Saint that did not love fasting. 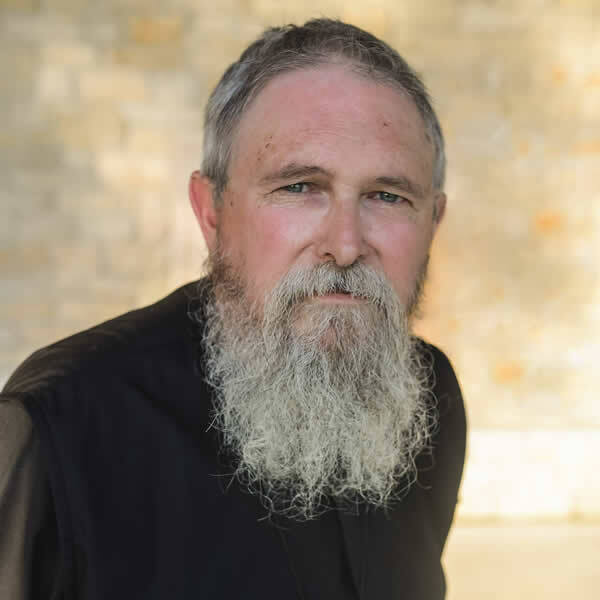 The second part (My question to Father Stephen) concerned the predicament that Christians living among secular folk -including their own close family- often find themselves in. They must often suppress what springs out of their hearts fervently and continuously in order to not alienate others or become tiresome to them. Not to be a nitpicky brat, but I’d really like to be able to share this without all the pedants among my friends losing the message for the typos. Could you perhaps look over it again? You’re missing a word in paragraph 2, for starters. If I might ask, what is the story behind the image you used to illustrate this article Father? Was that a real advertisement from some puritanical outpost of the British Empire or something from Hollywood? It’s real, from Puritan New England, ca late 1600’s. 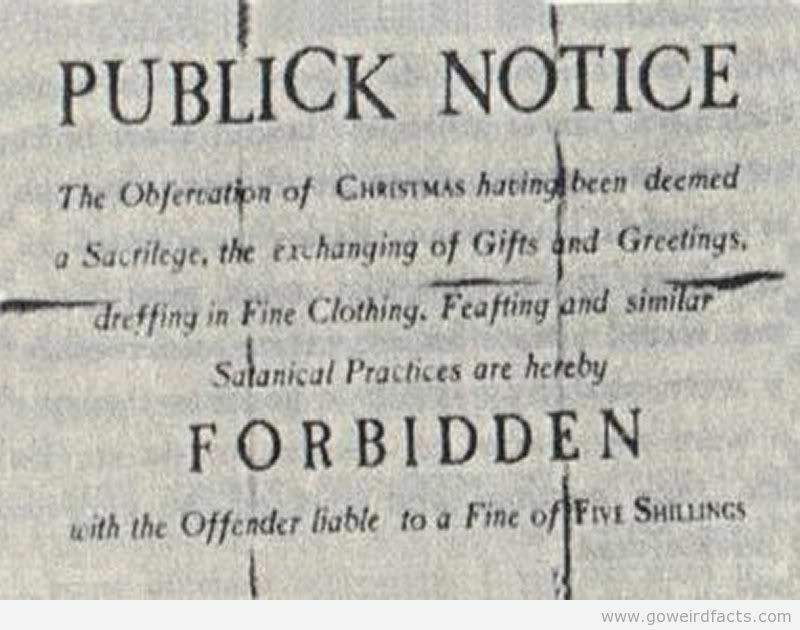 But the laws against Christmas celebrations were quite common wherever the Puritans had power. They were put in place during the time of Oliver Cromwell (the Puritan dictator of England in the 1640’s). This flyer is quite typical. Glad to fix things – I find proofing difficult. Gadzooks! I’ve just finished going back through. Thanks for the head’s up. Grammar stuff is not nitpicking. Mistakes are distracting and in some cases undermine confidence in the writer. I appreciate the note. Father, please could you explain what you mean by “the Kingdom suffers violence (but not the world).” I have tried to interpret it in several different ways, but none seems quite right. William G., Christmas was indeed banned in England for a brief period during the Commonwealth (the time between Charles I and Charles II when Oliver Cromwell was in charge). It was a capital-P Puritan idea. Needless to say, it didn’t go down well and only lasted a few years; but after that, although the feasting and drinking came back, we in England lost many of the folk-religion aspects of the festival which so effectively weaved faith and daily life together. As to the authenticity of the picture itself, I am uncertain. Matthew 11:12 is the origin of the phrase the “kingdom of God suffers violence.” It refers to our ascetical efforts by which we “press forward” (in St. Paul’s language) into the reality God has given to us. I was contrasting that “violent” possibility with the “non-violence” of God’s work which always seems to maintain a sort of “plausible deniability.” No matter what He does, the work of God never seems to force itself on our acceptance. It does no violence to the hard-hearted. thanks so much Dino for your kind words. Even before becoming Orthodox, I would see people’s eyes glaze over (so to speak) when the topic stayed on Jesus too long . I think heaven would be hell for the lost, since Jesus would be the main topic of heaven forever. Dino, as far as words are concerned, you are quite correct. Yet…I wear an inexpensive brass Old Believer’s cross that my wife bought for me from an internet site headquartered in Estonia. It is about 1″ by 1″. I’ve have gotten quite a few comments on it. Occasionally since it replicates the icon of the Crucifixion including the skull of Adam, I’ve been able to share an Orthodox understanding. Also, despite a general level of unbelief in my wife’s family (my wife being a shinning exception), I got appointed family offer of grace when we get together for Thanksgiving, Birthdays or Christmas. So, I pray in an Orthodox manner. The rest of the time I am mostly ignored. There are moments. And I am the least saintly person I know. An excellent article and thank you for posting it. Fr., forgive me for offering a correction, but I believe the phrase “the Kingdom of God suffers violence”, comes from Matthew 11:12. I know this may be completely beside the main point of this post. And, if it is a rabbit trail for another post comment, then ignore it and forgive my dullness. Nonetheless, I am going to ask a question. I realize that the formulation of my question may be completely wrong. But I have to use the meager words and articulation upon which I have to draw, clumsy though it be. Your statement, “The miracles of Christ are more than moral lessons – they are genuine invasions of this world by the Kingdom of God, the in-breaking of heaven to earth.” prompts me to ask about the purpose/goal of “intercessory prayer.” Since “change” of soul and body is part of maturing in Christ as it is experienced in the temporal realm, how is intercessory prayer understood in the Holy Tradition?